Record Store Day 2011 is now in the books and I’m sitting here with stacks of new vinyl and cd’s wishing I could sit here with stacks of new vinyl and cd’s for much longer than the hour or so I have left tonight before I snuggle into a record jacket for the night. What did I get today? Great stuff. What have I been listening to lately? So much. I’m constantly discovering great new tunes and by golly I’m going to invest a few minutes into a blog entry about it. Off! – First Four EPs – Guilty pleasure. Keith Morris from Black Flag and the Circle Jerks teamed up with members of Burning Brides, Rocket from the Crypt, and Redd Kross (!) last year to pump out 4 ep’s of fast, loud, punky goodness. Today there was a single with a few tunes recorded live at Generation Records in NYC. Love it. Zakary Thaks – Passage to India. One of the great garage bands of all time – fuzzed-out guitars, Beatle-y harmonies, great songs, and a good measure of weirdness. This recent compilation has it all. LateNightTales: Midlake – One of my favorite current bands gets their shot at this awesome series. Every song on this compilation is a gem, and not just their Black Sabbath cover. The 70’s acoustic-psychedelic-folk feel they trade in sent me shopping – I’ve bought cd’s from Bob Carpenter, Jimmie Spheeris, and Bread, Love, & Dreams. Beautiful. TV on the Radio – Nine Types of Light. I love this band. Their post-punk-electronic-rock mix is infectious and one of the best bands I’ve ever seen live. Their new CD is tremendous. Orchestre Poly-Rhythmo de Cotonou – Cotonou Club. Afro funk masterpieces – their first record in 4 years – worth the wait! The Feelies – Here Before. Speaking of worth the wait – their show last year in Millennium Park was 22 or so years since the previous time I saw them and was pure joy. Their new cd craft brilliant arrangements and brilliant songs. It all started here late last night with 2nd Hand Tunes opening at midnight. People drove in from Gurnee and Wadsworth (45 – 60 mins.) which made for great people watching and general music geekery. I’m pretty psyched I got a copy of the Dangermouse / Daniele Luppi 45″ with Jack White and Norah Jones, Mumford & Sons recording with Indian musicians, and the first Grateful Dead lp in Mono! 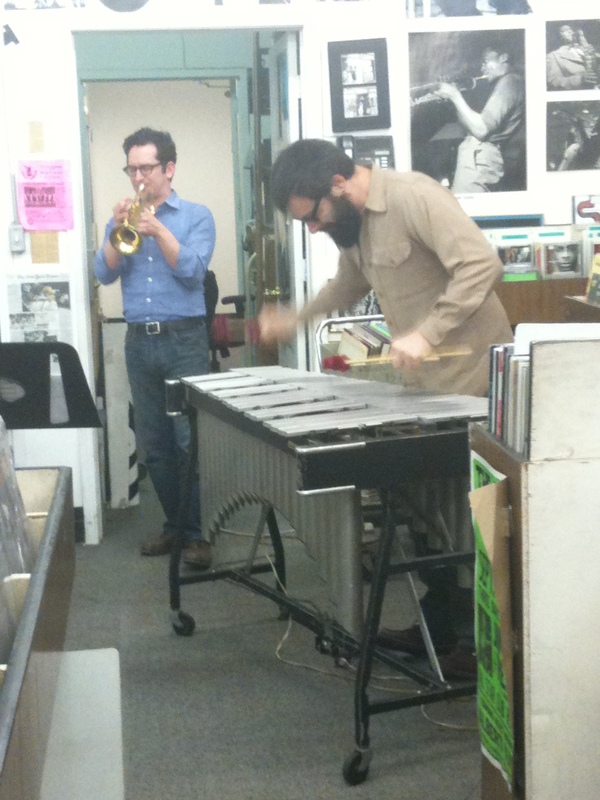 Saturday started out at the Jazz Record Mart, meeting Brian and Nikki, and hearing a great hour of duos performed by two current Chicago all-stars: Josh Berman on trumpet and Jason Adasiewicz on Vibes. Great power and depth to their set, and wouldn’t you just know it – listening to great live music is a delightful addition to and encourager of a shopping experience! 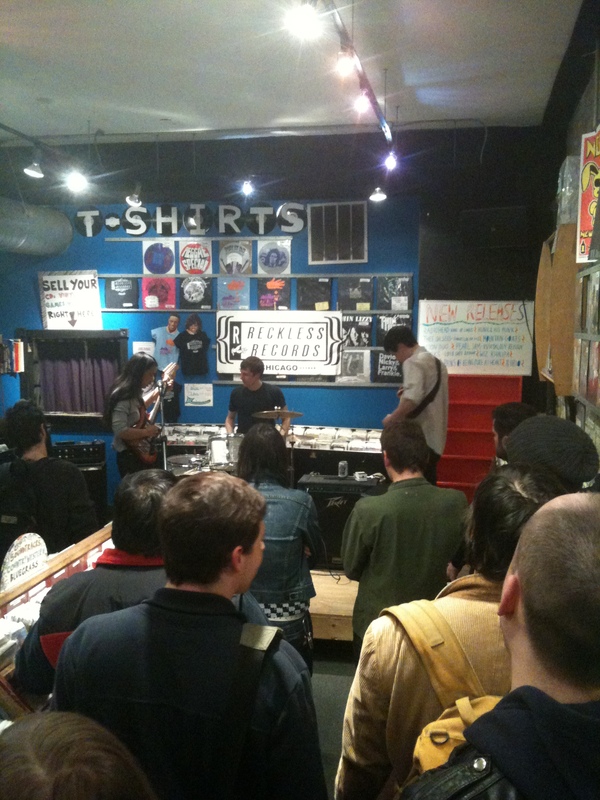 The afternoon kicked off with a visit to Reckless in Wicker Park and a dynamite set from Tyler Jon Tyler. Great garage pop from this trio, topped off with female vocals and catchy-as-hell tunes. Other visits: The Numero Group’s one day only pop up store on Milwaukee Ave., Dusty Groove (all hail! ), and Permanent Records (rock on!). An exhausting and totally satisfying bunch of hours doing what I love to do, and am lucky enough to live in a city still filled with the house of wonders that is the independent record store. 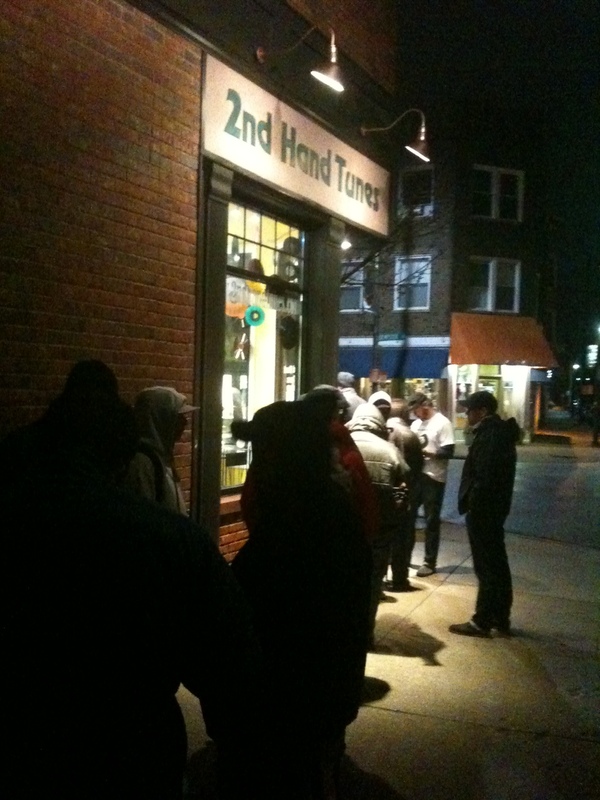 Don’t worry – I’ll be back before RSD 2012!